Templating based on existing objects. This extensions aims at improving the end-users productivity. It automatically creates a set of prefilled objects out of existing data. Preset work orders on a user request, depending on the selected service, to be executed when the request is being assigned to an agent. This can be combined with Object Copier… for instance: Create a “Move to production” request from a CI. 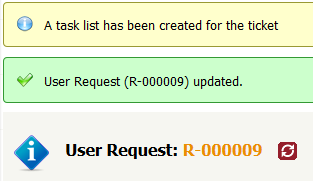 The request gets automatically (or not) assigned, then the work orders are prefilled. Note that in most cases you will have to alter the existing data model to define your template class. The objects being in the scope of the trigger can be filtered out by the mean of an OQL: SELECT UserRequest WHERE team_id_friendlyname='Doers'. Optionaly perform a series of actions (set a value, apply a stimulus) back on the triggering object. 2017-11-15 1.0.13 Fix error displayed in error message or tooltip, about read-only attributes being set. 2017-09-29 1.0.12 Showing action in object details only when target class is writable. 2017-04-04 1.0.11 Case logs : when using set on a case log, the entry was set twice, the HTML formatting was lost, and if the log was first copied from the source, it was broken. 2016-08-09 1.0.8 Fix for compatibility with iTop 2.3.0 (still backward compatible): properly handle the breadcrumb + bug fix when using hidden fields and case logs. 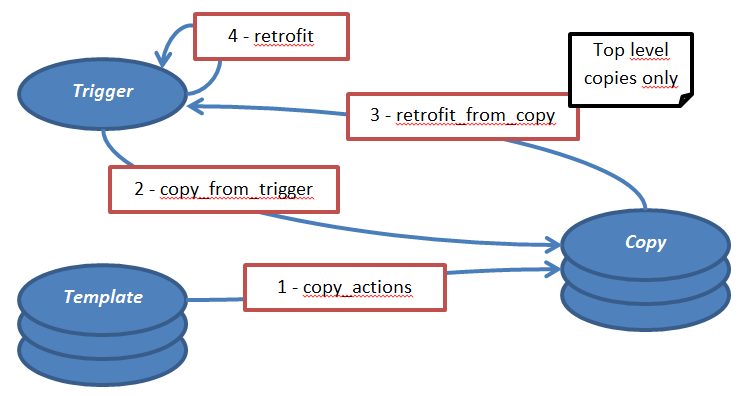 2015-07-02 1.0.5 Transfer data from the triggering object to the copies: copy_from_trigger. New verb for custom actions: call_method. Expand the ZIP file, then copy the contents of the folders itop-stencils and itop-object-copier into the extensions folder of iTop and launch the setup again. When prompted to select the extensions to install, check “Object copier” and “Stencils” in the list of available extensions. report_label can be localized without the burden of create dictionaries. To do so, create the settings report_label/<language_code> (e.g. “menu_label/FR FR”) for each supported language. The setting report_label will be the default value. If copy_hierarchy is set, then make sure that the query templates will not return at the same time templates and one of their children. Otherwise, children templates will be instantiated a number of times (first as a template, then and as child of one of the templates). Adding the condition AND parent_id = 0 will be sufficient in most of the cases. append attcode,string Append the string to the attribute (destination). The string can contain placeholders (see explanations below). Commas must be escaped with a backslash. Newlines (\n) are allowed. The character set must be utf-8. set attcode,value Set a value (destination). If the value is a string, it can then contain placeholders (see explanations below). Commas must be escaped with a backslash. Newlines (\n) are allowed. The character set must be utf-8. There is no verb for recording (insert/update), because the module is in charge of that. This is of particular interest when implementing call_method: you do not need to call DBUpdate on the destination. On the other hand, should you modify the source object, then you have to save it to the DB. Anyhow it is wiser to perform the modification from another actions set, where the modified object will actually be the destination. Before 1.1.2 with iTop 2.4.0 or above, if you have defined a custom date format for your iTop, the a date attribute is not decoded correctly when using $this->attcode$ or $trigger->attcode$​, leading to an error | Error | itop-stencils: rule #3 - Action: set(start_date,$trigger->start_date$) - Wrong format for date attribute start_date, expecting "Y-m-d H:i:s" and got "13-12-2018 00:00:00". These are the limitations of Object Copier. The workaround is to use the verb 'call_method' (new in 1.0.4) and implement your need as a method of the destination object. If an error is found (wrong OQL, the target object cannot be written, …) nothing is shown in the GUI.